“Carbon Dioxide: The Good News” – This is the title of a recent Global Warming Policy Foundation report (Goklany, 2015) that focuses on the benefits of CO2 for people. In a hard-hitting foreword, eminent physicist Freeman Dyson claims that the entire scientific and policy establishment has been suffering from a form of “tribal group-think” that involves systematically ignoring the “obvious” facts about CO2. The reason I find this report dismaying is not that it misrepresents the science. In fact, much of it is quite correct and moreover, well-established in the scientific literature. But given the ever-increasing politicisation of climate science, its author evidently found it appropriate to set up a straw man hypothesis, according to which CO2 is said to be “evil and dangerous” (by whom? ), and to write the report in a polemical way that tends to draw the reader to a conclusion that because this straw man can easily be burnt down, the current international interest in emissions reduction is entirely misguided. He accuses the IPCC (Working Group 2) of putting a particular, negative gloss on the impacts of climate change on crop yields, for example; but then he puts his own very particular gloss on several topics, including the celebrated warming “hiatus”, the subject of an extensive recent literature that he largely ignores, in favour of the popular pastime of rubbishing climate models. Let’s start with some of the many points where Goklany is quite right. I am paraphrasing what he says, but I think I have captured the essence; and added a few of my own asides. CO2 is indeed “plant food”, as well as being essential to a habitable climate! Both facts are universally known by plant and climate scientists. Rising CO2 levels in the atmosphere enhance crop yields. (For C3 crops including wheat, soybean and rice; but not maize and sugarcane. The latter group are already highly productive because they use the C4 photosynthetic pathway, whereby CO2 is concentrated to high levels around the chloroplasts. So in effect, they already have the advantage of a high CO2) Some experiments have shown that the gains can be less than standard plant physiology models predict; but that the gains are real is not in dispute. It follows that these increased yields owing to rising CO2 have undoubtedly diminished pressure to clear further land for agriculture. Correction of nutrient deficiencies is common practice already. The fact that CO2-induced productivity increases may not be fully realised due to nutrient limitations in natural ecosystems is largely immaterial for agriculture. Rising CO2 enhances productivity in natural ecosystems. The degree to which this effect is limited by nutrient availability is disputed, and seems to be different in different ecosystems (according to experiments). Nonetheless, this CO2 “fertilisation” effect can account (and is the only plausible mechanism) for the fact that terrestrial ecosystems are continuing to take up about a quarter of total anthropogenic emissions of CO2. There is no sign of any abatement of this “carbon sink” (see our blog: How much CO2 can trees take up?). Rising CO2 increases the water-use efficiency of plants. Measurable increases in green vegetation cover are occurring in semi-arid regions, because of this effect (see Ukkola et al. 2015). Aggregated indicators of human wellbeing continue to increase, confounding some early predictions of imminent environmental collapse and providing no evidence in support of the idea that CO2-induced climate change as far as it has occurred already represents a significant threat to human health or wealth. Today’s climate models still perform poorly when it comes to predicting local climate changes, or precipitation patterns generally. Comparing future projections from different models shows their predictions are inconsistent; they can’t all be right. More powerfully, predictions of past eras show that they have systematic biases, which are still not well understood (Harrison et al. 2015). There are some likely benefits of rising temperatures that should be weighed up against the hazards, including (up to a point) crop yields in mid- and high latitudes, and the reduction of excess winter deaths in many parts of the world. Some climate change impact assessments (especially some early studies on crop yields) failed to account for the beneficial effects of CO2; these should now be considered unrealistic, except as sensitivity tests. A fortiori, any human-health assessment that considers only the effects of climate change on pathogens or vectors, ignoring the positive effects of continuing investments in public health, should be considered completely unrealistic. The impressive improvements in crop yields over recent decades have not been primarily due to the CO2 They are simply too large to explain by CO2. Instead, technology has played a key role, and technological advances will continue to be required as agriculture has to adapt to an inevitably changing climate. A major international effort, the CGIAR Program on Climate Change, Agriculture and Food Security, exists for just this purpose. This point actually seems to be closely in line with Goklany’s thinking. Just as climate change is not a major (negative) driver of human wellbeing, CO2 has not been a major (positive) driver, either. Human agency remains paramount. Rising CO2 is and will continue to be accompanied by a changing (warming) climate. (The true value of “climate sensitivity” – the long-term effect on global mean temperature of a CO2 doubling – continues to be controversial, but studies of past climates show that it is within the range predicted by climate models.) Along with the beneficial effects of CO2 on crops we can therefore expect more frequent heat stress events, which are a major cause of crop failure today. The most recent global assessment of crop yields in a changing environment found positive and negative effects for spring wheat and soybean – the positive effects mainly from rising CO2­ and the negative effects mainly from heat stress. For maize, because it is already benefiting from internally concentrated CO2, the projection was all negative. Thus, the picture is mixed, and not all positive as Goklany’s report suggests. On a couple of other very important points, Goklany is wrong. The brief treatment of sea level focuses on the differences among recent records (in particular, whether there is evidence for acceleration of sea level rise during recent decades), but ignores the fact that current, measured rates – whichever set of data you use – are much higher than rates recorded geologically for any period the 10,000 years or so, prior to 1700. He implies that the continuing sea level rise is not due to anthropogenic climate change but rather to some other, previous climate change. This is not consistent with the evidence. And sea level rise matters, because of the huge investments that will be needed to protect populous coastal cities. Some investment will be needed anyway, but it would be perverse in the extreme to make climate policy without taking account of the economic consequences of sea level rise. The report concludes that halting the CO2 rise “abruptly” would be a bad idea. However, no conceivable policy could do that; it would be a physical, economic and political impossibility, and no one is proposing it. Now to be sure, certain lobby groups and NGOs, some media commentators, and a few advocates from the scientific community have used evidence selectively to support extreme environmentalist positions on climate change. In a previous blog post I commented on a report by three NGOs that claimed bioenergy was “dirtier than coal”, based on indefensible premises. The claim that 350 ppm represents an ideal CO2 concentration is highly questionable, as Goklany notes. I and several other plant and climate scientists recently commented on a published paper that used faulty logic to derive alarming, negative predictions of the effects of climate change on the future “suitability” of tropical lands for primary production (see the online discussion following Mora et al. 2015). However, the various benefits of rising CO2 are actually well established in the scientific literature, even if sometime ignored. They are indeed “good news”. (This good news do not apply to other greenhouse gases, but CO2 is still the main story.) The good news should not blind us to the negative implications of continued unabated climate change, and the multidecadal lead times required for policies to have any discernible effect on CO2 and climate. These are the reasons propelling international pressure for long-term carbon neutrality, and nothing that Goklany says in his report invalidates them. Finally, a comment about the unfortunate effects of political polarisation in science. I contend that Goklany, like previous contributors to the GWPF publication series, is in effect allowing the terms of discussion to be set by environmentalists! I do not think this is a good idea. It is peculiar that Goklany cites so much literature showing the beneficial effects of CO2 yet still appears to maintain that this work is ignored by scientists. It isn’t. We scientists produced this work, and we continue to use it and build on it. We do not claim that CO2 is “evil and dangerous”, nor do we imagine that models are truth! Polarisation makes for neither good science, nor sensible policy. Concern for human wellbeing is not the preserve of any one political tendency, and scientists are not lacking in it. We have a common interest; we should find a common cause. Mora C, IR Caldwell, JM Caldwell, MR Fisher, BM Genco, SW Running (2015) Suitable days for plant growth disppear under projected climate change: potential human and biotic vulnerability. PLOS Biology 13: e1002167. Harrison SP, PJ Bartlein, K Izumi, G Li, J Annan, J Hargreaves, P Braconnot, M Kageyama (2015) Evaluation of CMIP5 palaeo-simulations to improve climate projections. Nature Climate Change 5: 735-743. Ukkola AM, IC Prentice, TF Keenan, AIJM van Dijk, NR Viney, RB Myneni, J Bi (2015) Reduced streamflow in water-stressed climates consistent with CO2 effects on vegetation. Nature Climate Change. Exactly! In fact there was a lawsuit brought against the EPA by some organizations in Massachusetts that went to the U.S. Supreme Court. The USSC sided with Mass that since the EPA had ruled that CO2 was a toxic substance, a pollutant, it was bound to regulate CO2 emissions under the Clean Act. The fact that when the EPA labeled a gas essential for all life on earth a pollutant did not generate outcry from our universities, our science societies, the media and Congress speaks volumes about how totally idiotic this issue has become. Eisenhower, in his farewell address, warned that the growing funding of all science by the government could lead to this sort of situation. The EPA is staffed by Progressive (Left) activists who decides what research get funded and what does not. When a group of members of the American Physical Society pushed to have natural climate variability included in APS statement on climate change research, it was turned down. They recommended that only anthropogenic causes of climate change be studied. Nov 3, 2016 – China’s demand for coal power is growing so fast that the country will build a new coal power plant every week until at least 2020. Grantham got a few things right, but they made several glaring mistakes. Wrong. Maize (corn) and sugarcane also benefit from additional CO2. They benefit only slightly under otherwise optimum growing conditions, but they benefit dramatically under drought stress — and a lot of corn is grown under varying levels of drought stress. Grantham are also downright delusional in what they say about sea-level rise. That graph depicts sea-level rising very steadily at 15.33 mm/yr for 3500 years, ending less than 8000 years ago. That’s at least ten times the current rate. But Goklany is right, and Grantham is wrong. The evidence is compelling that the current (minuscule) average global sea-level rise cannot be due to anthropogenic climate change, because sea-level is rising no faster now, with CO2 over 400 ppmv, than it was 85 years ago, with CO2 under 310 ppmv. We’ve done the experiment, and we’ve seen the result: despite a >30% increase in atmospheric CO2 over the last 3/4 century, there’s been no increase at all in the rate of sea-level rise. The green trace is CO2 — which obviously hasn’t affected the rate of sea-level rise. Thanks daveburton for pointing out two errors in Iain Colin Prentice’s blog post. First, you are right that rising CO2 can benefit C4 crops when under drought stress. Experiments on maize have shown no effect of CO2¬ enhancement on growth under well-watered conditions, but a positive effect under drought. (This further reinforces Prentice’s point about the beneficial effect of rising CO2 on crop growth.) Second, the rapid sea-level rise that took place after the end of the last ice age did not end 10,000 years ago as was stated, but some time around 8,000 years ago. This was because of the long time taken for the warm postglacial climate to melt the huge ice sheet that covered much of North America during the peak of the last ice age, and retreat of the West Antarctic ice sheet (though this had a minor influence). It is true that recent global sea level rise has not closely followed CO2. There are two reasons for this. First, it is not driven by CO2 itself but rather by temperature, which acts on sea level in two ways: the thermal expansion of water, and the melting of glaciers and ice caps. The time course of global mean temperature has not closely followed CO2 either; it shows clearly the influence of other factors, including internal variability and volcanic eruptions, superimposed on its general upward trend. Second, both of the processes tending to increase sea level involve a considerable time lag (as is well demonstrated by the thousands of years taken for postglacial sea-level rise, mentioned above). The sea-level record is therefore “smoother” than the temperature record. Nonetheless, the present rate of global sea-level rise is 3.2 mm per year (about a quarter of the average rate during the period between 18,000 and 8000 years ago), and it has been increasing steadily since 1850. Finally, we would like to make a simple point about the scientific interpretation of climate and related records. Assessment of causal connections is not only based on the comparison of time series. Instead, we assume the laws of physics apply. A warmer ocean must expand; warmer air temperatures must reduce the size of glaciers; and water released by melting must flow out to the sea. Given present global warming, we would have a major puzzle on our hands if sea level were not rising! Moreover, the effects can be calculated. We can now quantitatively account for the observed rate of sea-level rise (now much more precisely measured by satellites) based on observed warming and observed glacier melting. All of this is explained in great detail in the IPCC chapter referred to above. Rising CO2 is and will continue to be accompanied by a changing (warming) climate. Is it? CO2 is has been rising, unchecked, since before the beginning of this century, yet the temperatures have not risen noticeably for over 18 years. Could it be that the two are NOT connected? Also, what sea-level rises? The only place I have heard about the dangers in sea-level rise is on web sites that insist it is real; looking at the rest of the world, those places where it is supposed to be threatening are doing very nicely – most of the island nations of the Pacific are actually increasing in size (thought the coral atolls on which many are may move and change their shape, but – hey – that’s nature! ), as is the estuary nation of Bangladesh; even the Maldives, while publically clamouring for aid, are privately engaged in entrenchment and enlargement, with no apparent real fear of engulfment. Carbon emissions ARE beneficial, and climate change is a false premise for purporting to regulate them. See Patrick Moore’s recently released lecture http://www.thegwpf.com/28155/. The Clean Power Plan and other CO2 regulations are very costly and lead to malinvestment in inferior technology such as renewable energy, and under-utilization of fossil fuels. The IEA estimated that “decarbonization” of the world economy will cost $44 trillion. That is nearly 30% of the cumulative savings of mankind over recorded history, and $7,000 for every person on earth. This so-called “investment” hints at future returns in the form of a better environment. A colossal waste of capital! Fossil fuels are the greatest productivity multiplier in history, but US regulations have closed hundreds of used-and-useful fossil-fueled power plants and channeled investment funds into wind and solar energy. These massive malinvestments will trigger the next financial panic. CO2 regulations are based on the the false premise that fossil fuels emissions cause climate change. Humans’ use of fossil fuels, and the resulting carbon dioxide air emissions, has no material effect on climate. Human activities cause only about 3% of all carbon dioxide (CO2) emissions to the atmosphere. The rest are the result of decomposing plant material. CO2 is in equilibrium. While a weak greenhouse gas in theory, its actual climate effects are nullified by stronger forces, particularly the formation of mineral carbonates from atmospheric carbon dioxide. Warmer weather from other causes increases natural CO2 emissions from rotting vegetation, and results in a higher equilibrium level of ambient CO2, as measured by Keeling. The notion of fossil fuels-caused climate change is a false premise for regulation. 5. Human activities generate only about 3% of CO2 emissions. Most of the rest come from rotting plants. Anyone who passed 10th grade chemistry can know this using public information. Limestone and marble are the most familiar forms of mineral carbonate. CO2 is an essential component of mineral carbonate (CaCO3, for calcium). Carbonates are the ultimate repository of atmospheric CO2. Carbonates form in seawater and soils through biological and chemical processes. The formula is CO2 + CaO => CaCO3. You can make magnesium carbonate in your kitchen by mixing carbonated water with milk of magnesia. For more detail see the paper http://bit.ly/1NziTF4 by Danish researcher Tom Segalstad. which, while being true, is true only in respect of individual CO2 molecules. What happens to individual molecules is not the point; instead the length of the duration of the increase in the size of the whole CO2 reservoir is important in the context of climate change, not the fate of individual CO2 molecules. “The turnover [residence] time of CO2 in the atmosphere, measured as the ratio of the content to the fluxes through it, is about 4 years. This means that on average it takes only a few years before a CO2 molecule in the atmosphere is taken up by plants or dissolved in the ocean. This short time scale must not be confused with the time it takes for the atmospheric CO2 level to adjust to a new equilibrium if sources or sinks change [e.g. by burning fossil fuels and opening a new channel in the carbon cycle linking lithosphere and atmosphere]. This adjustment time, corresponding to the lifetime in Table 1.1, is of the order of 50-200 years, determined mainly by the slow exchange of CO2 between surface waters and the deep ocean. The adjustment time is important for the discussion on global warming potential.” comments in  mine. Gavin C. Cawley, On the atmospheric residence time of anthropogenically sourced carbon dioxide, Energy & Fuels, volume 25, number 11, pages 5503–5513, September 2011. Anthropogenic emissions may be only a small percentage of natural emissions of carbon into the atmosphere, but natural uptake is greater still than natural emissions. Anthropogenic emissions are large compared to the difference between natural emissions and natural uptake, and it is the difference between total emissions and total uptake that governs changes in atmospheric concentrations. Anthropogenic emissions are tipping the balance between natural emissions and uptake, and hence atmospheric CO2 is rising as a result of our activities (fossil fuel, land use change, cement production etc.). I very much agree with the last paragraph of Prof. Prentice’s article! Please don’t comment without understanding. Contrary to the dogma of liberal-arts slackers, “eqilibrium” is not a deterministic value. Equlibria exist in a spectrum of values that change with the conditions. So, no, chuckles, ambient CO2 equilibrium is not a fixed constant. Where did all that limestone and chalk come from, again? How come I can look in the dumpster behind my favorite seafood restaurant after a busy night and find several tons of less-than-one-year-old carbonate “fossils”? Did you ever have to scrape a half ton of barnacles from your boat bottom after a few months in seawater? How come NASA’s much anticipated CO2 measurement satellite found that most CO2 is being emitted from the Amazon Basin, Sub-Saharan Africa, and South Asia? Not too many power plants there! Here we have a classic instance of Kahneman’s “fast thinking” combined with a near-terminal case of Dunning-Kruger Syndrome. Don’t ever change, Miner49er. Whatever…. You’re the smart guy in the room, and I’m just a mechanic—with $85 billion in patents. Balanced and objective, thank you for writing it. Because of the complexity of the CO2 effect on plants, the topic is a prime target for those wanting to propose a slanted view to the unaware. I don’t think I agree with this. The amount of CO2 assimilated due to the CO2 fert effect is not known, as it can’t be quantified with existing tools and data. It’s likely contributing, but we don’t know how much. The major driver of “terrestrial ecosystems continuing to take up about a quarter of total anthropogenic emissions of CO2” is biomass rebound from past logging and burning, probably enhanced in some places by increased temperatures and/or rainfall (but these latter effects too are basically unknown). You say that CO2 is rising as the result of anthropogenic emissions. However, the rise in global surface temperatures, on which the whole panic was originally based, has apparently ceased for almost 20 years. Is in not just conceivable to you that CO2 may not be driving temperature and that the addition of CO2 into the atmosphere might be wholly beneficial? Or is this too heretical a question? Do we really need to destroy our civilisation on the basis of an unproven hypothesis? Mike Post: Whether the rise in atmospheric CO2 is anthropogenic or natural does not depend on whether global surface temperatures are affected by atmospheric CO2 levels and vice versa. However the effect of GHG radiative forcing on climate is small compared to the effects of internal climate variability (e.g. ENSO) on the timescale of a decade or two, and so we should expect to see the occasional decade or two without a statistically significant warming trend. This is found in the output of individual GCM runs (e.g. Easterling and Wehner, 2009), but of course is not seen in the ensemble mean as that is only a projection of the forced response of the climate. The “hiatus” is one of those topics that has been well studied by scientists (IIRC there was a special issue of Nature Geosciences devoted to the question? ), but where the public discussion of the science is rather, shall we say “nuanced”. I think phrases like “whole panic”, “too heretical a question” and “do we really need to destroy civilization” are unnecessary hyperbole that just tends to further polarize the discussion, and possibly the sort of thing Prof. Prentice was referring to in his closing paragraph. Dikran: I do not understand your first sentence. However, the output of models depends on the assumptions. The models have failed and are useless for forecasting. The climate system is a coupled non-linear chaotic system, and therefore the long-term prediction of future climate states is not possible. Perhaps “hysteria”, as in madness of crowds, would be a better word than panic. The consequences for civilisation of activist climate scientists claiming to be able to predict the future climate on the basis of unvalidated models is that we are mis-allocating resources on a spectacular level. I do agree that environmentalists (Greens) should not be allowed to set the agenda. A typical consequence of letting the Greens take over is that we have the UK Environment Agency abdicating its responsibility for maintaining clean, free-flowing rivers (an engineering function formerly carried out by effective bodies such as Thames Conservancy) and instead caring for water voles more than people. Why, for example, would the Environment Agency be spending our money driving the installation of pathetic low-head hydro schemes at Teddington Lock and Marlow Weir but for the silly hysteria about a gas without which life would not exist? Mike Post, as I pointed out, the “hiatus” is not evidence that the models are unreliable. As Easterling and Wehner (2009) show, the models predict that we will occasionally see prolonged periods with little or no trend in GMSTs, although the models cannot predict when they will happen (as internal variability is largely chaotic). Foster and Rahmstof (2001) show that the apparent hiatus is plausibly attributable to ENSO and volcanic forcing. As I said, the discussion of the “hiatus” tends to be rather “nuanced” in the public discussion of climate, and it often ignores what the science actually says. The unreliability of GCM models is demonstrated by the fact that they have not, over the past twenty years, been able to reflect climate actuals. The twenty year ahead prognostications of 1995 bear no relation to what has actually happened. Each year the outputs of even the least alarmist models diverge further from the reality. The fact that some model creators have fudged their models to come close to past history does not indicate that the models are accurate – in fact we know that they are not since they do not handle the most important “GHG” gas, water vapor, or clouds or storm activity well if at all. It says only that any computer program can be changed to give desired outputs. It does not mean that the fudged algorithms are now correct and can be relied upon to predict future climate. These models are in fact a classic, and cautionary, example of GIGO. The childlike faith of some in the scientific community in the outputs of GCM models is touching perhaps but I wouldn’t spend a dime based on those outputs. Hmm, sailor1031, if what you say is true it would seem to require a vast conspiracy. Presumably you have some unique insights as to that. A rather aggressive response to a well-argued point, I feel, Mr Post; however, your frustrations can be understood. Dikranmarsupial seems to be arguing that the 3% that is the human contribution to the rise in CO2 is really causing 100% of the rise, which does seem an odd logic. One problem is that we have no idea whatsoever what the rates of change in … well… anything on the geological records that is anything less than per century or two (perhaps even per millennia! ), yet we look at what is happening within our brief few decades of measurement, and declare that it is unprecedented! Absurd, but it gets the headless chickens running around, and allowing further, more insidious progress to be made in the chaos. Welcome to the New World. And, yes, Prof Prentice’s last paragraph is very true; we have to stop the enviro-loons calling the tunes. Yes, it may seem counter-intuitive, but the important thing to bear in mind is that while natural sources put huge amounts of CO2 into the atmosphere each year, natural sinks take similarly large amounts out of the atmosphere each year, so the net effect of the natural sources and sinks in pre-industrial times was close to zero. As a result, when we started to burn a lot of fossil fuels (and land use change and cement production emissions), that tipped the balance and atmospheric CO2 began to rise as a direct result. Once CO2 levels started to rise, natural sinks started to increase (relative to natural sources), tending to restore the pre-industrial equilibrium, which is why atmospheric CO2 is rising more slowly today than the rate at which we are emitting it. Basically whether atmospheric CO2 rises or falls depends on the difference between total emissions and total uptake. The net anthropogenic emissions are small compared to natural emissions considered in isolation, but not compared to natural NET emissions. Anthropogenic emissions are about twice the magnitude of the net effect of the natural environment and in the opposite direction. … natural sinks take similarly large amounts out of the atmosphere each year, so the net effect of the natural sources and sinks in pre-industrial times was close to zero. Can you be sure of that? We do know that levels of CO2 have been drastically different from the present in times past; what caused those changes? Also, never forget that correlation is NOT causation – mind you, is there even a correlation? While the rise in human output of CO2 has been exponential, the rise in CO2 has been more or less linear; the rise in human consumption of fossil fuels has been even more dramatically exponential, yet CO2 rise continues to plod along at its rate of ~2ppm/year. Yes. The levels of carbon dioxide in the atmosphere have been pretty steady for the last 1,000 years, which implies that natural sources and sinks were closely matched, see e.g Law Dome ice core. That isn’t to say that levels don’t change on longer timescale, we know they do, e.g. in response to Milankovic cycles. We know the natural environment is a net carbon sink without correlations. Atmospheric CO2 is rising more slowly than anthropogenic emissions, for this to be true without violating the principle of conservation of mass, the natural environment must be a net carbon sink. There are many issues in climate science where there is genuine uncertainty, this just isn’t one of them. Hmm, as an environmentalist who’s been involved in climate issues for some 15 years, I must say I find that last paragraph obscure. As the ones who are saying most strongly that something needs to be done (based on the science), probably we have more or less set the terms of the debate, but how could things be otherwise? And what exactly would the happy alternative be? I see that farther up in the article you refer to the idea that CO2 should be limited to no more than 350 ppm as an “extreme environmentalist” view. You are aware that it’s a number that came from the Hansen et al. 2008 “Target CO2” paper (and is based on the paleo evidence pointing to a maximum safe level for preservation of the present ice sheets), right? Since then we’ve seen some strong and unanticipated evidence of the early stages of ice sheet, in particular in the Amundsen Sea Embayment of West Antarctica, which has only underlned the concern. So environmentalsts, me included, are responding to a scientific call for action. Would you prefer we do nothing? ICYMI please see this Beeb article from a couple days ago. Another scientist panics, it seems. Greening would probably help things up there were it not for the apparent rapid burn-off of the boreal forest. Reply to Dikran at 10.57am: I said nothing about a hiatus. Observations have run much coooler than the models. Would you fly in an aeroplane or drive over a bridge deisgned by failed modellers? However, to repeat: The climate system is a coupled non-linear chaotic system, and therefore the long-term prediction of future climate states is not possible. Mike Post, you wrote ” However, the rise in global surface temperatures, on which the whole panic was originally based, has apparently ceased for almost 20 years. ” that is the phenomenon that is generally referred to as the “hiatus”. It is not clear that the observations have run cooler than the models, this is and example of the “nuanced” presentation of the science in the public debate. The observations were in the tails of the spread of model runs back in 1998 as well, but that wasn’t evidence that the models were running cool, just “weather noise”). While the atmosphere-ocean system is undoubtedly chaotic, that does not mean that the climate (its long term statistical properties) are unpredictable. There are plenty of chaotic systems with predictable statistical properties (the example I usually cite is a double pendulum in the presence of an electromagnet – the effect of the electromagnet on the double pendulum is predictable, even though the precise path of the pendulum is unpredictable). A shame that it appears that pictures cannot be uploaded into these comments. I suggest you visit: http://www.metoffice.gov.uk/hadobs/hadcrut3/diagnostics/comparison.html to see how surface temperatures have flattened in the last 20 years despite the addition of significant amounts of the life-giving trace gas CO2 to the atmosphere during and before the period. You also might like to visit: http://www.remss.com/research/climate where the failure of the troposphere to warm up over the past 20 years is clear. There is also an interesting comment on the models failure to even hindcast accurately. Dikran, you said: “As I said, the discussion of the “hiatus” tends to be rather “nuanced” in the public discussion of climate, and it often ignores what the science actually says.” Unfortunately, in the public mind, “the science” is tainted. As you know, if you’re doing an experiment, you should report everything that you think might make it invalid — not only what you think is right about it; other causes that could possibly explain your results; and things you thought of that you’ve eliminated by some other experiment, and how they worked — to make sure the other fellow can tell they have been eliminated (Feynman quote). It was evident from Climategate that Climate Science does not work like that. Playing with models which use assumptions, that have been shown in any case not to work, is not carrying out experiments and is not science. Forgive me if I now disengage. Mike Post I’m not sure the MET Office would agree with your conclusions regarding their data: http://www.metoffice.gov.uk/research/news/recent-pause-in-warming . We know that there has been a flattening of the surface temperature datasets, as otherwise there would not have been a special issue of Nature devoted to the hiatus. The point is that (as Easterling and Wehner show), the hiatus isn’t totally unexpected, it certainly doesn’t show that the observations are inconsistent with the models. That site shows only a plot of global annual average near-surface temperature anomalies, without a statistical trend line. While it may appear to the Mark I Eyeball that surface temperatures have “flattened” in the last 20 years, climate scientists rely on appropriate statistical methods to distinguish underlying trends. It’s easy to pick multiple short-term flattening and even cooling periods out of the temperature-anomaly record since 1970. However, the trend over the entire interval, computed from three global surface datasets and two satellite records at the link I provided previously, averages about 0.16 degrees C per decade. The trend over the past 20 years averages about 0.12 degrees C per decade. Yet the other well-known trend computed from satellite data, by the University of Alabama Huntsville, shows warming of about 0.24 degrees C during that interval. With multiple independent global temperature datasets to choose from, why would you favor the only one that supports your case? I’m puzzled as to how you drew that conclusion, when five commonly-used surface temperature datasets all show that GMST has continued to rise during the last 20 years, at a rate only slightly less than that for the entire period since 1976. Pingback: Week in review – energy and policy edition | Climate Etc. 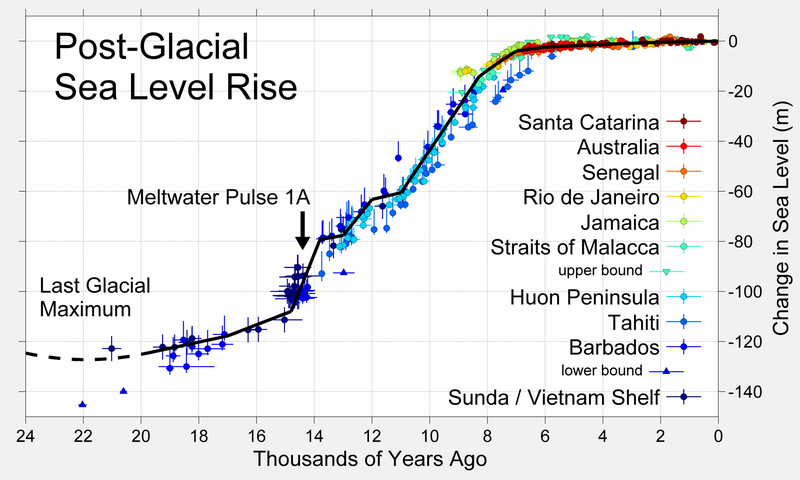 You say that sea level rise is higher now than 10 thousand years ago? You have got to be kidding! Just google “sea level rise chart” and look at the sea level rise at the end of the last ice age (8 to 10 thousand years ago). It was many times higher than today. Nice catch. So that should be relative to the last 8,000 years or so. People often forget that the major ice sheet melt extended into the Holocene. Solar longer term trend has also risen. So based on disagreement between model and observation during hiatus period why the panic of CO2 is still there. Nope on both of those. Re the solar trend, see here. Models are indeed running slightly cool relative to observations, but they’re expected to run hot or cold the bulk of the time. The current relative coolth doesn’t mean much on the time scales the models operate on. If they run consistently cool for the next 15 or 20 years, that’s a different matter, although all it would mean is a relatively small lag in the inexorable warming. Models running cool? Surely you are joking! Yes, but not *significantly*. As I say, you need to wait a while. In the meantime, things like unanticipated fast ice sheet melt and permafrost melt are happening. Solar trend though decreased in the last decade is still high. During 2nd half of last century solar cycles were very strong. Role of the sun during that period and possible interactions with other factors are not yet fully understood. Those who are working with models know very well how poor they are in picking up signals of climate variability. They cannot even predict peak and trough of ENSO cycles. Models are only good for shorter time scale. Thus people need to think whether any theory based on those models, supporting CO2 agenda, should ever be encouraged. Is it not a complete waste to produce various results for RCP scenarios? Scientists should do basic research to understand climate variability and factors responsible using observation. It is a shame to see so much money and funding are spent on model based work that even lacks basic understanding. It is the reason why there is no major step forward in climate research and prediction during last decade, as major focus is on one particular agenda. When scientists all around the world started raising their voices against CO2 alarm, including prominent scientists like Prof Lindzen, Prof Judith curry etc. from USA, what happened to UK scientists? More flaws on CO2 theories are emerging day by day, but not a single scientist from UK in position and power is showing any initiative. Are there lack of critical thinking? We hope UK scientists will show more courage and lead the climate science in right direction. Pipa, apparently you don’t even understand the meaning of “trend.” As you can see here, the solar trend is sharply down since mid-century, more or less the period during which the planet warmed the most, and right now it’s quite low relative to the rest of the record. Scientists have carefully examined solar trends and been unable to identify a significant long-term effect on climate. Proposals to the contrary dating back forty years have all been discredited. Er, no, rather famously they’re mostly only good for longer time scales. Perhaps you’re thinking of weather models. Oh, then you trot out the discredited Lindzen and Curry. Yep, there’s a tiny handful of mostly elderly scientists who are still fighting the scientific consensus on climate change. It’s reminiscent of the refusal of some older physicists to ever accept relativity. As Max Planck noted in that regard, it seems that science must sometime progress one funeral at a time. It must be great to just make stuff up as you do and think it explains anything. It is easy enough for readers to check the Wiki on sea level rise — https://en.wikipedia.org/wiki/Sea_level_rise — sea level has been rising as long as we have modern records, since at least the 1880s , at a more or less slow and steady rate — satellite measurements confirm no particular increase in this rise. If sea level began rising long before “anthropogenic global warming” then AGW is not the proximate cause. The IPCC states explicitly that AGW could not be discerned in “the wild” until at least 1950….70 years into the currently known modern sea level rise….what was causing the rise before 1950 ? What makes anyone think that cause suddenly ceased and AGW took over? Logical fallacy (in principle multiple causes can operate at different or even the same times), but more importantly the premise is wrong: AGW was already happening in the 1880s. While there were some limited anthropogenic emissions prior to 1850, generally that’s counted as the start date. Pretty much by definition, formal detection of such an effect necessarily takes place some time after it’s started. But of course you’ve been corrected on that point that multiple times. BTW, I can certainly visually detect the (slight so far) acceleration is sea level rise on the Wikipedia graph, and indeed that’s what the science says, noting the second sentence in the article you linked: “Additionally, sea level rise has accelerated in recent years.” Follow the footnote to the science. Do say hi to Andy for me. Reply to Steve Bloom ==> The meme that AGW “started” in the 1880s is incorrect — the IPCC is quite explicit on this. That the Little Ice Age ended around the latter half of the 1800s is widely accepted science and the run up from the 1880s is widely accepted as a return to more normal conditions. The IPCC cites the mid-twentieth century, generally around 1950, as the earliest date in which effects of increasing CO2 can be discerned at all…. This is the official IPCC stand. It is, of course, possible that warming attributable to man may be contributing to the already ongoing long-term sea level rise — which is also the official IPCC stand on the issue. Now, you are free to disagree with the IPCC on this — I disagree with a lot of things they say — but don’t try to brush off their conclusions as the silly misunderstandings of climate skeptics. Kip, I’m afraid your poor physical intuition is coloring your interpretation of the IPCC. Note that you’re confusing the date of formal (model) *detection* of AGW with the beginning date of the effects themselves. Detectability in other metrics (to a lower standard, note) is spread out through 1993. For global temperatures, if detectability at the level of *extremely likely* for *more than half* started in 1951, do you imagine it was zero in 1950? Of course the effect can be *discerned* (your word) in the record long before that (eyeballing, in about 1910, although as I note it had started before that). The AR5 WG1 full report should have the details if you care to look. Where the heck do you get that from? Things that are widely accepted by deniers aren’t widely accepted. If you want to continue this, I’ll need to see links and quotes. Me and my citations, eh? Don’t worry, Kip, you probably still stand an excellent chance of kicking the bucket before you’re forced to admit that the hippies, er, climate scientists and environmentalists, have been right all along. “Climate Warrior: That particular species of internet troll that inhabits climate-related blogs, fighting for Truth, Justice, and His Team’s Way, gloriously waving the Team Flag, wearing the Team Colors, and shouting Team Slogans. They come in two types CW(c) and CW(s) — (concensus) and (skeptic). They all use the same tactics — taunt, endless agruement, cut-and-paste quotes and “citiations” (usually off a list supplied by their superiors, though sometimes saved up like a squirrel’s acorns over years), ad hom attacks, use of illogic, lack of understanding of even basic science, sniping, and, the crowning glory, the “sure sign that you’re dealing with a Climate Warrior”, when you quit feeding the troll, it joyously declares Victory! I didn’t mistake it as an attempt at a compliment. I’d say it’s better applied to someone who first says “Bye” but then can’t resist coming back to an argument, especially if they do so only to engage in juvenile mud-slinging (and at your age, Kip!). Notice how you still haven’t backed up your erroneous interpretations of the IPCC with specific links and quotes. Absent such, why in the world do you think anyone would believe you given your view that the IPCC is broadly wrong? •	Trend changes if it starts from different periods and ends in a different point. Discussions based on those simple ideas are unimportant here. Main point is that the sun could explain temperature variation till mid-century. After that its sole variation could not match observation until a linear trend is imposed. That linear trend matches with CO2 variation. Ignoring all relevant complexity of climate systems, the simple explanation was put forward that CO2 is responsible for all this rise in temperature. As the sun was so powerful till the mid-century, how could it be playing a nominal role after that? It could also be possible that due to certain factors the role is completely different/reversed. This is simply one of the many unknowns in complex climate system, that we have not yet been able to answer. Now during hiatus period, even imposing that linear trend, the model results could not match observations. Does it not imply, simple explanations based on CO2 theory needs revisiting? •	I am not talking of weather models but global atmosphere ocean coupled general circulation models. Peaks and troughs of ENSO in CMIP5 models never match with observation. Different models show different ENSO variability implying global scale teleconnection features relating to ENSO is inaccurate in models. Similar with the phase of QBO. Thus the combined interactions of Sun, ENSO, QBO and related teleconnections are completely missing in models. This is only one of the flaws in models among many. Unless we sort those, how can we be so certain about CO2 theory based on models? •	Water vapour is the most dominant greenhouse gas. Greenhouse gas forcing on climate due to CO2 is 21% (while that for water vapour is 49% and for cloud is 25%). [http://carbonconnections.bscs.org]. The contribution of CO2 from fossil fuel is much less. If ENSO part in the model is not sorted out, we are missing dominant greenhouse effect due to water vapour. Moreover, it is well known, models are very poorly representing cloud. Again it implies we are missing the actual effect of ENSO and volcano (both closely associated with cloud). Those all need to be sorted before making simplified statement based on CO2 theory. •	Climate system is complex and we are not yet in a position to address many issues mainly related to natural variability. To mention a few: 1) In spite of Montreal Protocol, after banning CFCs, while scientists said Ozone depletion is in a state of recovery but this year major hole in Antarctica appeared. 2) Sea ice in Arctic is melting but it is accumulating in Antarctica (overall). 3) Arctic Ice should keep on decreasing with CO2 as predicted, but last two years it did not happen. 4) PDO and AMO mainly control temperature variability to a large extent. It is believed those are related to natural variability, but we are not yet in a position to tell the mechanism related to PDO and AMO. Until all these relevant questions are answered, the merit of CO2 theory is questionable. Where critical thinking is discouraged and an unwelcome environment prevails for open debate, the scientific progress is likely to suffer. For the eminent scientists in USA and other parts of the world who spoke up are at the final stage of their career and hence have nothing much to lose. Is it any coincidence that no young scientists are speaking up against CO2 theory? That’s all just hand-waving, Pipa, with not a single citation to be seen. It’s mostly wrong. Or against relativity, or most other long-established scientific theories. Think about that. In the meantime, try not to project your own agenda and confusion onto science. To Steve Bloom: What citations do you want to see? Anyone who is in the field of climate science is well aware of these facts I mentioned, and nothing is new here. That is the reason I did not go into any complicated scientific paper. It helps common people to understand the problem. We all know the fate of scientists like Galileo, Copernicus and many others and how much they had to fight for the truth. We learnt lessons from those events and should never let similar situations arise in 21st century. This is a plea to scientific community to work together, to build a healthy scientific environment, so that finding the truth is the main motto. I do not have any agenda or confusion. I am passionate about science and will always work for unveiling the mysteries of science. Should it not be the path of a scientist? Whatever arguments are used, there’s an awful lot of conjecture in the science. No one can prove any of it is due to human emissions of CO2, and no-one can prove it’snot natural variability. Global temperatures have been warming for 300+ years. The human component is suggested as only operating in the 50 years. What caused the previous 250 years of warming? As Al Gore likes to say, every bit of that is wrong. Check your facts. Hmm, first you told the scientist you were disengaging, now you’re back with this dreck? Sad. how come the academic people and politically empowered people are failing to convince the society the multinational companies, lobbyists or who cares for future and needs are today!! Now here is an interesting paper with lots of citations dating from the early 70s. – The primary (and practically the only) factor of global warming is our sun’s activity. The rest is negligible and pure bull. – Earth is a self balancing system. And CO2 is part of the regulated substances handled by it. If you want to “save the planet”, don’t ban CO2, but ban cutting trees on the Amazon and in other places. Without big forests, CO2 will remain in the atmosphere even if we stop producing CO2 completely. – But EVEN IF human produced substances were a factor to global warming, CO2 would be the most innocent between them. They are others WAY MORE effective, methane being one of them and weather manipulation substances are another group that no one seems to mention. – Earth has passed through periods of time where CO2 was increased to levels beyond our imagination. Certainly, there were no advanced humans back then and certainly it didn’t bring the end of life on earth. – Clearly, the scientific community is not able to understand how the climate on earth works. Believing that they should try to fix it on top of that is as silly as it sounds. And, generally, experience says that them fixing things is not something we have seen very often. Usually it is them screwing things. Previous Previous post: Taking the planet’s temperature: How are global temperatures calculated? Next Next post: How can an oil and gas company prepare for a low carbon world?